This is a fairly easy track from Geehi Camping Ground just off the Alpine Way 31 km South East of Khancoban. The old Huts in this area are really worth the time to stop and look at. The road travels through Geehi Camping Area to the Geehi Hut where it turns left to cross the Swampy Plains River. This is an easy crossing with solid floor (go slow... large river rocks). Continue across a flat plain and you will just be able to see Keebles Hut on the other side. Or you can go Right just after the river crossing (on the first track to the right) and follow the river around to the hut. Go left at Kebles Hut (up the hill by the river) and follow the main track. A few hundred meters on, you will see Doctors Hut over to your Right on the other side of the river. If you wish to explore this Hut, expect to get your feet wet. Continue on to the second crossing of the Swampy Plains River. This crossing is much wider than the first and can be deep after rain but it also has a solid floor, go slow is the key here. (large river rocks). Continue on the track until you come to an intersection and veer Left. 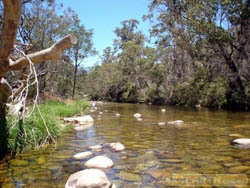 You will now come to Old Geehi Hut with a good campsite and also a good spot for fishing, especially fly fishing. You can enter your visit in a logbook in the hut if you wish. Go back the way you came to the intersection and veer left up an incline and veer left at the next intersection a few hundred meters on. Continue on and you will cross a small bridge on the Bogong Creek, (small campsite on left ... good trout fishing) and stay on this track until you come to an intersection a fair way on where you\'ll turn Right (stright ahead is a back road to Khancoban on private property). After a few hundred meters you will see Maj Clews Hut on your Right with good camping spot. This track will now narrow with a lot of \"Speed Bumps\" for water drainage. Keep following the main track until you come to the Alpine Way. Turn Left to go to Khancoban or Right to Thredbo. Below is a movie taken during a trip I made through this region. Stick to the speed limits on the Alpine Way as the Highway Patrol check this area with a venjance... especially the 60 kmh zone. This area is now targeted to be used with the NEW mobile speed cameras. Also be alert for other vehicles cutting corners, especially motor cycles.